The lists below are offered in good faith, but we do not accept any liability for errors or consequences thereof. 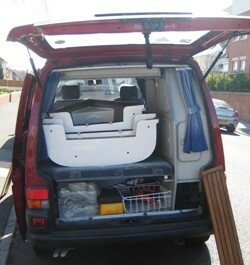 If you know of any other vehicles the Trio will or will not fit inside, please tell us. 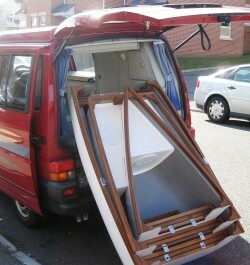 Please also note that certain options, such as the rubber fendering and some components of the sailing rig, make the boat slightly wider and may mean that it does not fit in a vehicle listed below. 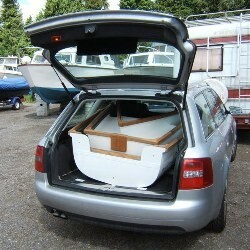 If transporting the boat in a car is a major consideration, please consider this and consult us before ordering. 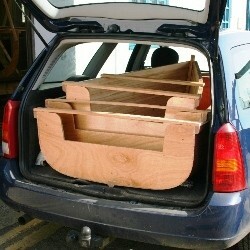 The key dimension is 107cm (3ft 6″), the maximum beam of the Trio’s centre section at the gunwhales (wooden trim). If you’ve got that clear between the rear pillars (where the tailgate opens) and also internally between the wheel arches, then it should be fine. 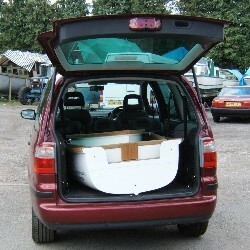 However it’s a boat, not a square box, so if your car is slightly narrower than that, particularly at wheel arches, there is often a way to get it in. Experience has shown, the only way to find out for definite is to try it. 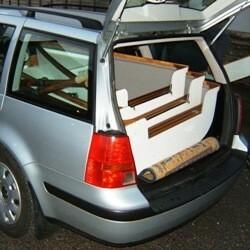 The nested length is 1.6m (5ft 4″), which usually seems to be available in cars with the appropriate width dimension. 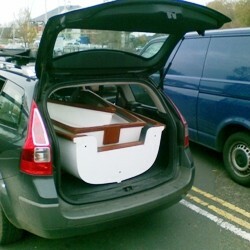 Another solution to transporting sectional boats on cars, without needing to tow anything or get a boat on a roof rack is the EasyBase. 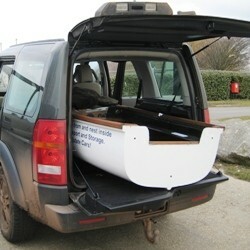 Whilst primarily designed for the Pram Dinghy, it could be adapted to the Trio, preferably the lightweight hull version. See, EasyBase. 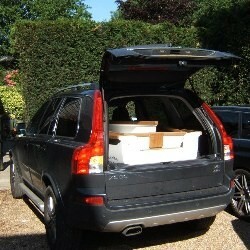 – Ford Focus estate (current); Ford Mondeo estates (most if not all other than 2000-2007 which is definite); SMax; latest Galaxy. 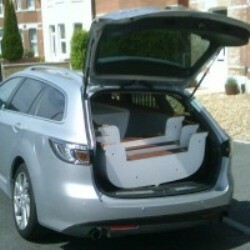 …fits very neatly on the bed!